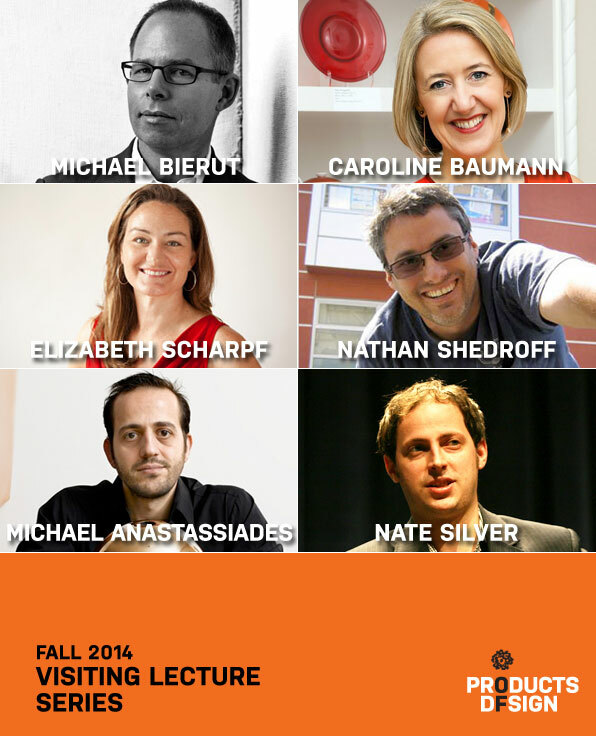 Fall 2014 Visiting Lecture Series Announced! Caroline Baumann is the Director of the Cooper Hewitt National Design Museum, and was previously acting director of the museum since September 2012. She also served as associate director, acting director and deputy director between 2006 and 2009. From 1995 to 2001, Baumann worked at the Museum of Modern Art, where she raised funds for the museum’s Yoshio Taniguchi building project among other accomplishments. Before that, she was the director of development at the Calhoun School in Manhattan and art book editor at George Braziller Publishers. She received a master’s degree in medieval art from the Institute of Fine Arts at New York University and a bachelor’s degree in the history of art and French literature from Bates College in Lewiston, Maine. Michael Bierut is a Partner of Pentagram, responsible for leading a team of graphic designers who create identity design, environmental graphic design and editorial design solutions. He has won hundreds of design awards and his work is represented in several permanent collections including: the Museum of Modern Art (MoMA) and the Cooper-Hewitt, National Design Museum in New York. He served as the national president of the American Institute of Graphic Arts (AIGA) from 1998 to 2001, and is a senior critic in graphic design at the Yale School of Art. Bierut is also the co-editor of three Looking Closer graphic design anthologies, as well as a co-founder of Design Observer. Nathan Shedroff is the chair of CCA's groundbreaking MBA in Design Strategy. He is one of the pioneers of experience design, an approach to design that encompasses multiple senses and explores the common characteristics in all media that make experiences successful; he also works in the related fields of interaction design and information design. Nathan speaks and teaches internationally and has written extensively on design and business issues, including the update to his 2001 book, Experience Design 1.1. He maintains a website with resources on experience design. He's a serial entrepreneur; works in several media; and consults strategically to help companies build better, more meaningful experiences for their customers. Elizabeth Scharpf is the Chief Instigating Officer at Sustainable Health Enterprises (SHE), a social venture recognized by Harvard Business School, the NYTimes’ Nick Kristof, and Bill Clinton for shaking up the status quo in the international development industry by using business solutions (rather than the charity/donation-only approach) to tackle some of the world’s most pressing problems. SHE’s first initiative is SHE28 which addresses girls' and women's lack of access to affordable menstrual pads in Africa, Asia, and South America causing them to miss school and/or work. SHE is currently helping women roll out a franchise model in Rwanda manufacturing and distributing affordable, eco-friendly menstrual pads by sourcing local, inexpensive raw materials (e.g., banana fibers) and leveraging existing female networks. Nate Silver has become today's leading statistician through his innovative analyses of political polling. He first gained national attention during the 2008 presidential election, when he correctly predicted the results of the primaries and the presidential winner in 49 states. In 2012, he called 50 of 50 states. Previously at The New York Times, Nate is pioneering the new field of data journalism with his award-winning website FiveThirtyEight, exploring politics, sports, science, and more. In addition to his work on FiveThirtyEight, Nate appears on ESPN as an on-air commentator. Born in Cyprus in 1967, designer Michael Anastassiades moved to the United Kingdom in 1988 to study civil engineering at London’s Imperial College and industrial design at the Royal College of Art. In 1994, he founded his London studio. Anastassiades’s designs can be found in hotels, restaurants, and stores across the globe, as well as in the permanent collections of major cultural institutions—including the Museum of Modern Art in New York, the Victoria & Albert Museum in London, and the FRAC Centre in Orleans, France. He has collaborated with a variety of designers and manufacturers, among them Hussein Chalayan, Swarovski Crystal Palace, Flos, and Lobmeyr.